Two weeks into his law practice in Pelican Rapids, a client stared Chuck Krekelberg square in his face. = With a squint in his eyes, the client posed the big question. Chuck Krekelberg enjoyed being in the courtroom and litigation, but he was also driven to serve–attributed in large part to his Catholic upbringing. He was well known for offering services “pro bono” at no charge through the non-profit Northwest Legal Services, to the disadvantaged and under-represented. A guy’s faith shouldn’t mean a hill of beans, especially a full century after the arrival of the first Scandinavian Lutherans to the Pelican area. But with the distinctly “Nordic” townships of Trondhjem, Oscar and Norwegian Grove to the west of Pelican; and the Swede Grove settlement to the southeast–a three-syllable, Germanic name like Krekelberg was uncommon. And..the coffee shop talk no doubt quickly circulated the fact that the new lawyer in town grew up on the “other side” of Otter Tail County. Over there: Where the steeples of a half dozen Catholic churches pierce the sky; from Dent, to Perham to Rush Lake to Bluffton and Butler. In Pelican Rapids 1978, Charles A. Krekelberg was, indeed, a minority. This separation 0f the law, and the church, was successful for Krekelberg. 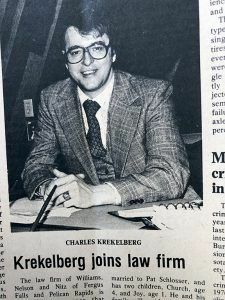 Charles “Chuck” Krekelberg in 1978, when he joined the Williams, Nelson and Nitz law firm in Pelican Rapids, which was founded by attorney Henry Polkinghorn. When farmers were under assault in the 1980s, during the ag crisis years, Krekelberg became one of the region’s top authorities in family farm debt restructuring, foreclosure and bankruptcy. He served more than 200 farm clients–Lutherans and Catholics–not only in the greater Pelican area, but throughout the region. To a struggling, desperate farm family in the 1980s, sound legal advice was paramount–whether it came from a Methodist, a Baptist, or a Mormon. Krekelberg’s collateral with farm folks was also earned–the hard way. He grew up one of nine kids, on a small dairy farm east of Dent. He knew a bit about agriculture by the time he was able to walk. Krekelberg handled the first Otter Tail County case under the state’s new Chapter 12, bankruptcy-related legislation that gave small farmers tools to stave off creditors, maintain control of the farm, reduce the interest rate to market level, and extend payments over 20 to 30 years. In one successful case, Krekelberg proudly noted that farm is still in the family to this day. Farm clients have always been central to the Krekelberg law practice. In retirement, Krekelberg plans on writing several books. One of the key topics will be the farm crisis of the 1980s. “Catholic ghetto” is how Krekelberg describes the community of St. Joe’s. St. Joe’s was really just a “place.” A rural Catholic “village.” It is still identified on some current maps; a few miles southwest of Perham. There was a St. Joe church, which later burned. A rectory where the priest lived. And even a convent,which was listed as the “Sister’s School” in turn-of-the century documents. Remnants of old St. Joe in the form of a sturdy brick structure still stand today, though now owned as private property. “It was a very close community; a very Catholic community; it was the center of everything,” said Krekelberg. Kids were all over the place. 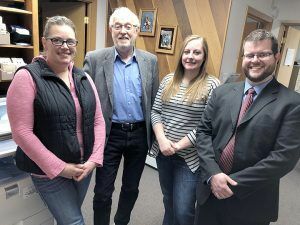 Pictured at the main street Krekelberg law office building, a historic structure that was originally the J.P. Wallace Bank, are Jennifer Hams, Chuck Krekelberg, and attorneys Lindsey Forsgren and Chad Miller. Krekelberg, who has practiced in Pelican Rapids since 1978, retired this year. Most families averaged nine to fourteen girls and boys. Some were even larger. Interestingly, St. Joe’s had an eight grade school which was originally a private Catholic school. It evolved into a public, country, school. “But the crazy thing was, in many ways it still functioned as a Catholic school,” recalled Krekelberg–with religious studies and Bible school. The one neighborhood Lutheran kid of Krekelberg’s era didn’t last long. He transferred up to Perham. Though the Krekelberg story is really about a small town lawyer, the Catholic connection is a thread untangle-able. As a young teen, Krekelberg left home for his education–to the Crosier private school in Onamia. On a path to become a priest, he went on to St. John’s University, a prominent Catholic liberal arts school and seminary in central Minnesota, where he spent nine years. While in law school, he worked as a legal assistant at a prominent Minneapolis law firm–very valuable experience, which served him throughout his career. Chuck Krekelberg, with a scattering of newspaper clippings and other documents spanning his 40 year practice in Pelican Rapids. 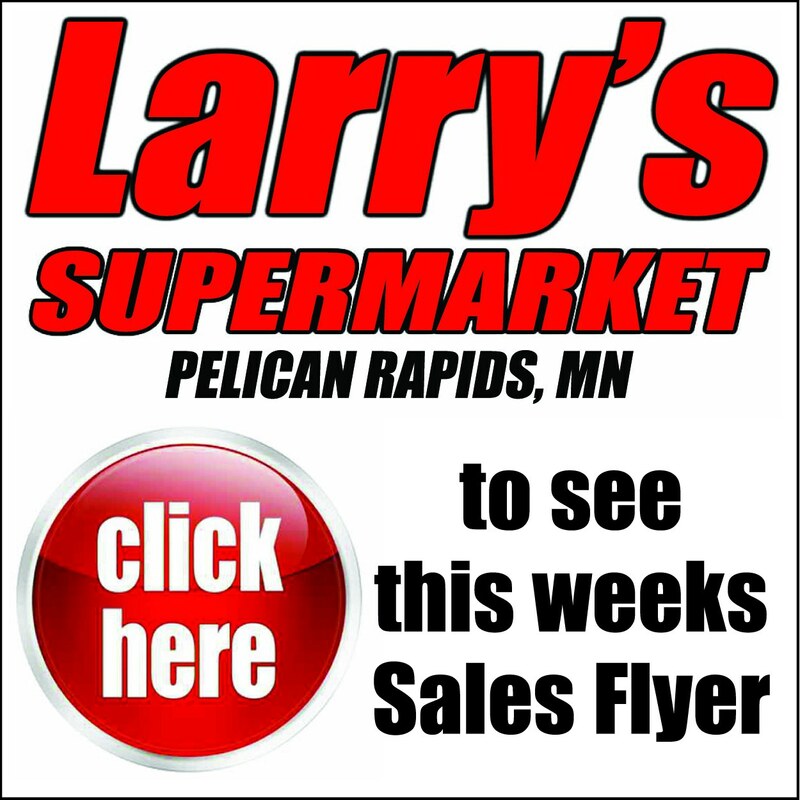 He has been active at St. Leonard’s Catholic Church, in Pelican Rapids Area Rotary Club and has served in officer roles with the United Way, Lakeland Hospice and the Good Samaritan Nursing Home. 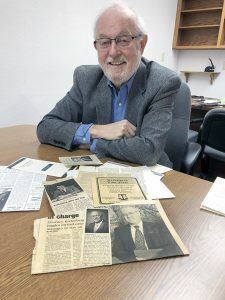 In 1978, he joined what was then Williams, Nelson and Nitz law firm in Pelican Rapids, a firm started by Henry Polkinghorn, who later served as an Otter Tail County judge. Service, to the community but also to those in need, is a characteristic ever since his youth–nurtured by his Catholic upbringing and education. This background inspired Krekelberg’s long association with Northwest Legal Services, which offers legal help to the poor. 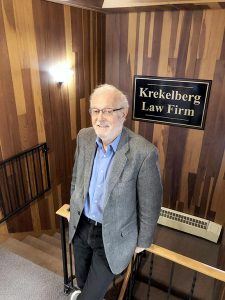 Divorce, custody, estates, bankruptcies, probate, civil litigation, real estate, personal injury, business law…as a rural Minnesota attorney, Krekelberg’s experiences covered virtually all areas of law. Unlike many attorneys, Krekelberg chose not to enter the political arena. As a litigator and mediator, his objectives were usually to resolve issues, finding compromise, and arriving at solutions; which is not always consistent with elected, legislative bodies–especially these days. There were legal situations that are somewhat out of his expertise. 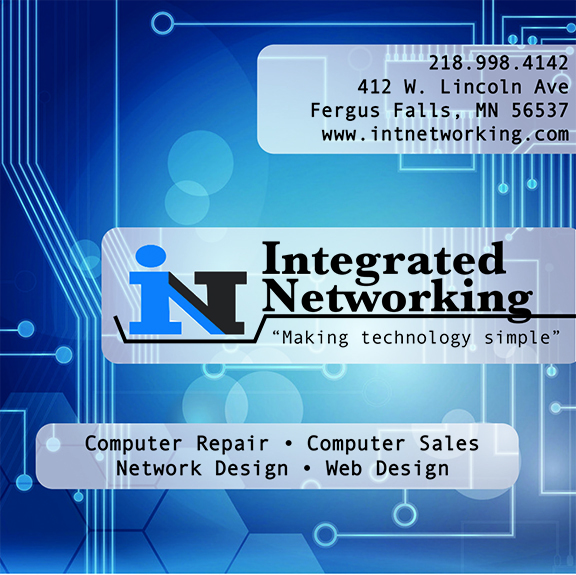 There have been some cases that were “too big” to handle for a small firm. In some of those instances, he collaborated with another firm with certain legal specialties and backgrounds. What sort of cases has he declined? In closing comments, it was difficult to avoid discussing the sexual abuse scandals that have shocked Catholics across the globe. He recalled the Bishop speaking to a group, where it was suggested that the Catholic “rank and file” were not ready to let women be ordained…or for priests to marry. One of the oldest women in the congregation rose her hand and said “I’m ready,” recalled Krekelberg. Had priests been allowed to marry, back in his seminary days, Krekelberg said he may have continued on has path toward ministry. But – that would have changed the course of history. Tens of hundreds of clients would not have been represented by Krekelberg over the past four decades.